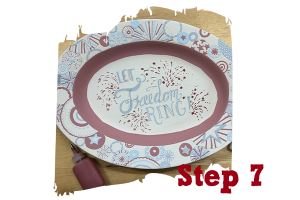 Add a pop of color to your 4th of July celebrations with our Let Freedom Ring Platter! It’s perfect for a patriotic BBQ! Step 1. Pick out your platter and paints! 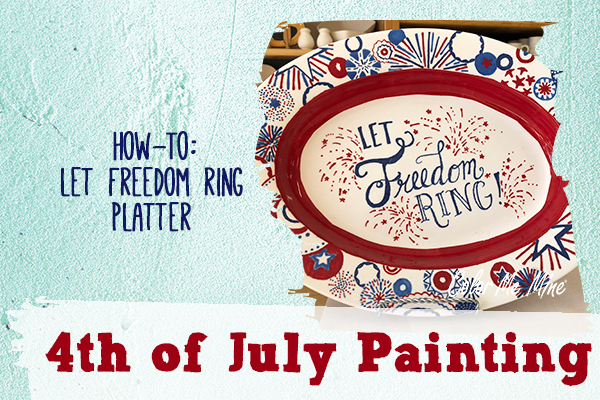 First, grab the platter that best fits with your other patriotic table decor. For this design, we recommend a rimmed platter to allow you a separation between your lettering and design elements. Next, pick out your paints. We used a red (98), three shades of blue (11, 47, 64), and white (67). Step 2. Tape off your piece! 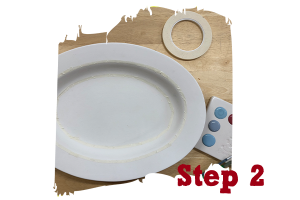 Use masking tape to tape off the edge of the rim and the area where the side of the platter and the bottom meet. 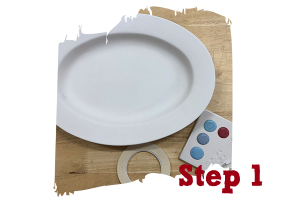 This will be painted solid to provide a separation between your rim and the rest of the platter. Step 3. Paint your solid! First, decide which color you would like to use for your solid barrier. We used red (98) because we wanted to make the lettering blue and use more shades of blue on the rim. Make sure to add 3 coats of paint to get a solid color. The first coat will dry the fastest, and the next two will take longer. Make sure to let your coats finish drying before starting the next. Step 4. 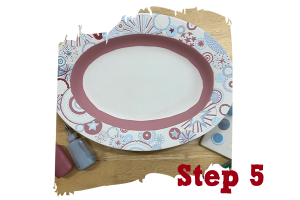 Stencil on your design! 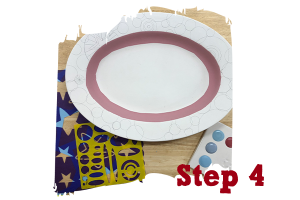 Grab some stencils and decide what will work best for your platter. We used varying size circles and stars to give the rim a firework effect. Make sure to use a ballpoint pen because it will fire off in the kiln. Step 5. Add some color to your design! Use a thin brush or paint pens to paint on your design. We used our shades of blue (11, 47, 64), mixed in with the red paint (98) to add in our designs. You can add lines, make some solid, use dots, or whatever else you want to get your desired effect for the design. 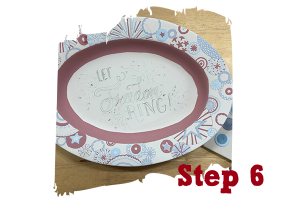 Try to vary up your designs around the rim to give the platter a random firework look. Step 6. Sketch your words! Use a ballpoint pen to sketch out your lettering design. Decide if you want brush script or more basic lettering before you start sketching. You can always take a peek at our Pinterest (@colormeminerocklin) for some inspiration. Step 7. Trace over your lettering with paint! Grab a thin brush or a paint pen to trace over the sketch of your lettering. We used a lighter blue (64) for the words and red (98) for the fireworks. Quick tip: If you’re a perfectionist, turn your design upside down so that you are just tracing lines rather than letters. It can make it easier to paint when you are tracing a design instead of words. Once you are done, leave the rest to us and we will glaze and fire your platter while you finalize your 4th of July party plans and menus! We will call when it’s done and you can pick it up in time to serve all of your family and friends! Paint by Friday, June 29 to pick-up in time for Fourth of July!